Today is the final delivery of the 2015 season and we harvested a great share for ya! Thank you so much for being a member of our CSA this season. As the remaining field crops mature, we’ll be providing them to a few local chefs. Look for our produce this winter at Jul’s in Tyler, and at Texas Spice at the OMNI Hotel in Dallas! As our work load slows down a little, this winter is a great time for a farm visit. We love spending time with our farm members, so drop me a line if you’d like to come out for a visit. Come see how your food is grown and get to know your farmers. We’d love to see ya! We’re focusing all our attention now on preparations for spring. We’ve started the onions and leeks in the greenhouse, prepared the garden with cover crops, and ordered great seed varieties. We will be opening our spring 2016 season registration in just a few weeks, and the harvest will start in April. You may not remember in past seasons, but registration fills up within a few weeks, so make sure you’re checking your emails from us near the New Year so you can jump in. 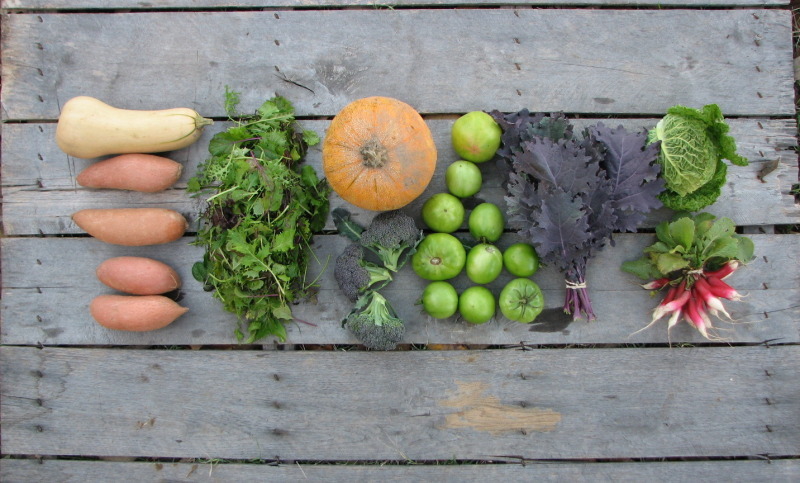 If you would like to give a Red Moon Farm CSA share as a gift this holiday, drop me a line. I’ll help you arrange it with a gift certificate! Butternut Squash—Use within 2 weeks. Butternut squash take longer to cook than most winter squash, and the peel is not edible, so be sure to remove it. The flesh is super dense, hearty and so delicious. Pumpkin—If you’ve never eaten pumpkin beyond pumpkin pie, you have to try it! This is a powerfully nutritious food. Slice it into crescent shaped wedges like a cantaloupe, then roast at high heat until beginning to brown at the edges. Just salt and pepper it and cut the rind away with a knife and fork and enjoy the sweet, rich flavor. Pumpkin also makes a great pasta sauce with sage and Parmesan. Broccoli—A few large florets of tender, flavorful broccoli. This stuff is so good, it doesn’t make it to the kitchen at our house! Radish—Large shares received Diakon or Easter Egg varieties, and small shares received French Breakfast radish. These are wonderful just sliced with lemon and salt. And the tops are edible too! They’re a bit like turnip greens. Sweet Potato—Great flavor and nutrition. Green Tomatoes—If you received any pink-ish tomatoes, give them a few days on the counter, they may ripen all the way to red! The green ones are ready to go into a nice tomato chutney with golden raisins. Never tried it? This stuff is seriously good. Use as a burger topping, on pork chops, or on a mixed cheese plate. Red Russian Kale— This kale is simply gorgeous with it’s vibrant color. It will turn green after cooking, so we suggest leaving it raw in a thinly sliced salad. You can also find lots of kale recipes in our Kitchen! Asian Field Greens—Our custom mix of frost tolerant and tender greens. It’s an eye catching mix of flavors and textures suitable for using in salads or for braising or roasting. Cabbage—These are young and tender and are great for a salad or made into a light slaw with apple slices and lemon. They have a great texture and flavor. You may have received our smooth leaved, cone-shaped variety or our crinkly leaved, round variety. These typically get between 1-2 pounds so they’re petite little cabbages. 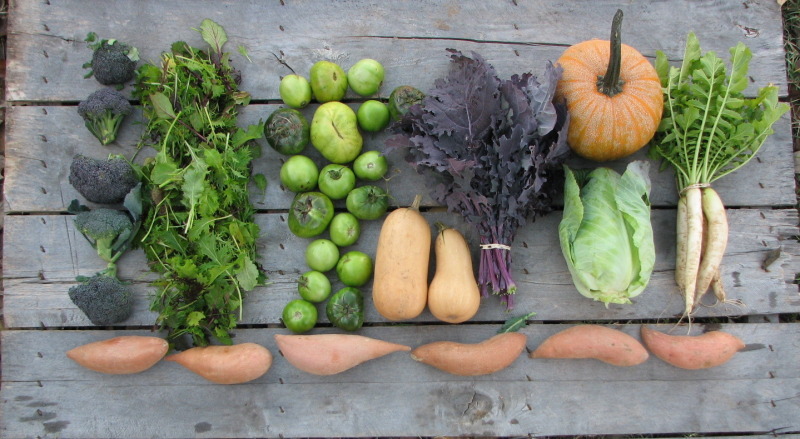 Large share from left: Broccoli, mixed Asian field greens, green tomatoes, butternut squash, Red Russian kale, pumpkin, cabbage, daikon radishes, and sweet potatoes. Small share from left: Butternut squash, sweet potatoes, mixed Asian field greens, pumpkin, broccoli, green tomatoes, kale, cabbage, and French Breakfast radishes. Thank you for linking to my green tomato chutney recipe, and for reminding me of it! That stuff is wildly good, and I need to make some more.